File descriptors are often used in conjunction with file input and output. However it is not that clear for many people what file descriptors essentially are and that makes it harder to code. That's what I will try to elaborate in this article so that you really know what you're dealing with when you close file descriptors, duplicate them, pipe them, etc. Notice that this article uses code and conventions from C.
file1, file2 and file3 are file data structures. A file structure is an opaque data structure. Opaque means that we don't really know how that data structure looks like and we don't either bother about it. All we need to know is that a file structure represents a file on a hard disk, a USB stick or whatever other storage device. When you start a new process, three file descriptors are created by default. These three file descriptors are called the standard file descriptors and are given the numbers 0, 1, 2. If you remember the Unix mantra, it says that everything in a Unix system is considered a file. That is even true for hardware devices like your monitor and keyboard. In fact there are file structures in the kernel that are corresponding to just those. The file descriptors 0, 1, 2 are indices to these special files. To be more exact, 0 is the index corresponding to the "keyboard file" and 1 and 2 are indices corresponding to the "monitor file". Earlier we said that there are three file descriptors created by default: 0, 1 and 2. We said that 0 corresponds to the "keyboard file" in the kernel and 1 and 2 correspond to the "monitor file". If we were to sketch all this on paper, it would look a bit like below. Process1 has the three default file descriptors we talked about. Notice how we hide the "keyboard file" and "monitor file" in the kernel box. That is mostly for simplicity as there is a lot of things going on in the kernel. Other than that the user(in this case the programmer) is not meant to know the inner workings of the kernel. The only thing the programmer can see is the C-like FILE structures and the file descriptors so we play that way. Now there is something more than file descriptors in this figure. It's the arrows that show the flow of the data. These arrows, call them channels, call them buses, call them rivers, or whatever you like, have a special name: streams. Stream is just an abstract name to make it easier for the programmer to visualize what is happening with the data. It's merely easier to talk about stream of data than to talk about indices and the file structures in the kernel that those indices correspond to. 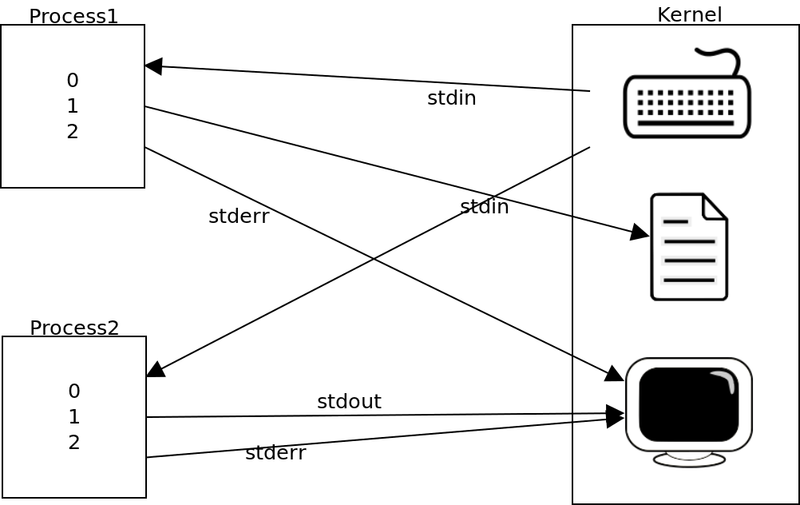 Now in C and many other languages there are three specific macros that are called stdin, stdout and stderr. These are not streams although they have the same name. That wouldn't be possible anyway as streams is just an abstract idea(as said earlier) so that the programmer has it easier to visualize what is happening(even if it makes it a living hell for some). 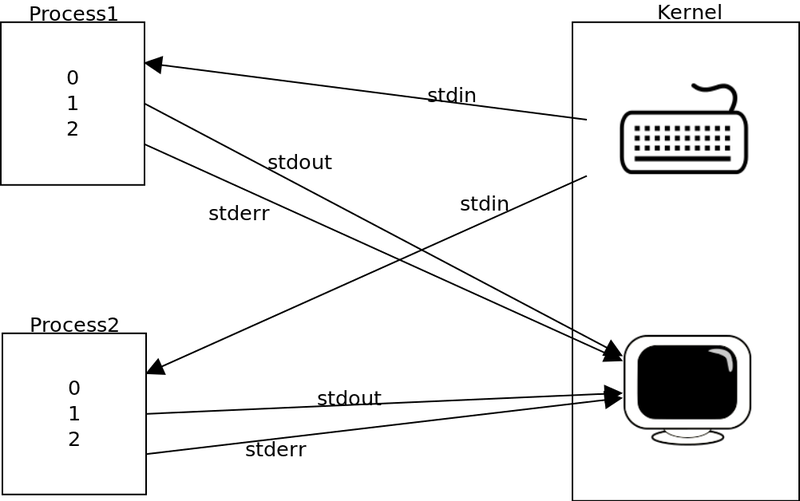 The stdin, stdout and stderr macros in C are just pointers to FILE structures(the C-like ones). You can in fact use these functions as you would use any FILE when programming in C. For example see the code below. Will print "linuxmeerkat" on the screen. A question arises: Why do we have two macros that direct data to the same place? This is the same question as: Why do we have two streams to the monitor? The answer is rather simple. Many times when we develop a program we need to output errors on a different channel than the normal output. It's just more neat to keep different things separated than mix them. Think for example how easier it is now if we want to hide all error messages in our program or just redirect them to a different place than the monitor. It's an important detail to understand that file descriptors are the only file-relevant thing that a process can keep track of. As said earlier FILE structures in C are just a wrapper for a file descriptor so they can also be thought as file descriptors to justify the fact that a process has knowledge of only file descriptors. Now, each process keeps its unique file descriptor table. Say that we have two processes: process 1 and process 2. Just because we say that file descriptors 0, 1, 2 are standard it doesn't mean that they are always going to correspond to stdin, stdout and stderr. Standard streams are as we think until the programmer decides it's time to change things around. That is something that I will demonstrate. Bellow you see a visual representation of file descriptors and their connection with the kernel. This is how the processes look like if we assume that file descriptors are not altered in any way. The arrows show the flow of data. The keyboard and screen icons in the kernel are file structures of the special files. The truth is that things are more complicated in the kernel. However now we focus on keeping track of the file descriptors. That's also the only thing we can alter directly from inside the process. However don't assume that because there are two icons that there are only two file structures. From this output it's crystal clear that file descriptor 1 is not pointing to stdout anymore. In fact it's pointing to the file myarticle.txt. How do I know? The reason I know is that the usual behavior of the kernel is whenever we try to create a new file descriptor to give it the lowest number possible. That keeps things clean. Following this paradigm, after we close the stdout stream in the example, we immediately create a file for writing. This file needs a file descriptor. The kernel sees that the lowest number that can be used is 1 so the file gets that index number. What about the file in the kernel that already has index 1? you might ask. As we said, the kernel is a bit more complicated than shown in the above figure. The kernel doesn't mess files from different processes, even if they are the same files. So file descriptor 1 from the first process corresponds to a totally different file structure in the kernel than the file descriptor 1 in the second process. That's something that a programmer shouldn't worry about. As we said.. care only about the file descriptors. The kernel is a magician that you shouldn't be aware of how his tricks work. We see a new arrow there pointing to a new icon in the kernel. That icon is a new file data structure created in the kernel. The new arrow is a stream like stdin, stdout, stderr. The only difference is that we don't have a standard name for it. However we can clearly see from the figure that the data is flowing to a file and particularly the file myarticle.txt. Notice that stderr is still flowing to the monitor. That's also the reason we can still print text on fprintf() to the screen. If we closed this channel then we wouldn't be able to output anything on the screen anymore. When we say that a file descriptor is removed or closed, it means that the file descriptor is destryied! Deallocated. No returning back. Nada! It's gone forever and ever! We have lost it and with it also lost the stream it was connected to. Now I want to remind you of the popular so called memory-leak in C. Say we allocate some memory in a function for a pointer. If we have only one pointer to the allocated memory space and somehow we lose it, we automatically get a memory leak as there is no way we can reach the memory where the pointer was pointing at. In C a solution would be to have a backup pointer and that's also a solution used with file descriptors. filefd2=filefd; //this is where we "duplicate"
This is wrong and will not work. You see we don't make a new file description in this case. filefd2 and filefd are going to have the exact same value and thus being the same exact index. The idea of duplication is to make a new file descriptor, a new index. In this example if we delete filefd, there is no way to access the file structure in the kernel through filefd2 as filefd2 and filefd are the exact same thing and thus deleting one is like deleting the other. filefd2=dup(filefd); //this is where we "duplicate"
This should output the text "test" on the terminal.